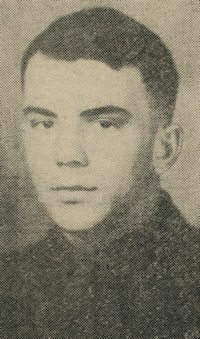 Obituary – Treeman, Ralph William “Bill” Jr. « Perry High School Alumni Association, Inc.
Obituary – Treeman, Ralph William “Bill” Jr.
– son of Mr. and Mrs. R. W. Treeman of Perry, was born in Perry on Nov. 18, 1919 and attended the elementary grades in Perry and high school in Perry. During his high school career he was a football player. Following graduation he expects to attend A. and M. college and take a Business administration course. Ralph William “Bill” Treeman, Jr.
Ralph William (Bill) Treeman, 95, retired owner of Creek County Hardware, died Sunday at the Oklahoma Veteran’s Center, Claremore. He was born in Perry, Oklahoma on November 18, 1919 to Ralph and Irene Treeman. Bill is preceded in death by his wife, Maxine. He is survived by his loving children and a great host of other relatives.